The ongoing Australia-South Africa Test series has been nothing short of controversy. The 2nd Test saw Rabada getting banned for accumulating demerit points, but later overturned. This series was also known for the ugly episode between De Kock and David Warner. One can imagine the tension between the two side. Australia being the dirty side they have always been, would do anything under the sun to win games. They are known for playing against the spirit of the game even before, but the event that happened in the 3rd Test was over all the limits. 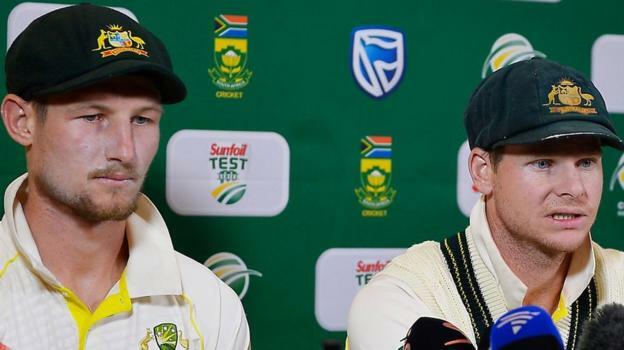 It was the 3rd day of the third test match between Australia and South Africa, Cameron Bancroft and Steve Smith was caught in the midst of a ball tampering incident. So how did this tampering incident transpire ? The leadership group make a decision to alter the condition of the ball in order to aid the Australian pacers with some reverse swing. But they just picked the wrong guy ! They picked an inexperienced Cameron Bancroft to do the thing. Ball tampering happened before as well, but first time I’m seeing such an inexperienced man do it for the team ! Anyway Bancroft being a new guy didn’t want to disobey the leadership group. Cameron Bancroft is seen with a yellow tape, altering the condition of the ball and slippping the tape back to his pocket. He is caught doing that on camera and Lehmann face changes when he sees that on the big screen. He passes an information to Handscomb about the incident, who then informs Bancroft. As the video is played again and again, he takes the tape from the pocket and slips it into his trouser. A plan that failed miserably! The next thing I see is Smith and Bancroft confessing the fault in the press conference and admitting to change the condition of the ball. I mean it was so bold about Smith to talk the truth in the press conference, but the crime has been committed. He even said the leadership group knew about the thing and had pre-planned the act as well. How cheap have Australian cricket come down to ? All the legacy you associate with Australian cricket has been hurt miserably. Captains like Don Bradman never had to do such acts to win games. They brought a lot of respect. Sir Don Bradman would have died in shock if he was alive. All the captains I’ve seen till date would have felt if there was a need to live. It includes Waugh, Ponting, Clarke and all the former captains. There is a certain amount of respect associated with the baggy green cap. Every player earns it, it is not something which is easy to get. Maybe the current crop of cricketers need to understand the value of the baggy green. One would have to say cheating was in Smith’s genes when he was part of the dressing room review controversy back in India. Kohli was right all along when he said he would never share a beer with such people. Someone whould have kept check of Smith rather than supporting him. He has let the country down. Let the people down. He was on track to be the world’s best batsman and now he is a national shame. ICC has given a 1 match suspension for Steve Smith, which is fair enough by the rules. But not at all fair enough for the crime conducted. It’s pre-meditated cheating and in my books, this guy doesn’t deserve any support. Cameron Bancroft has been handed a 75 percent fine for the act, which is not fare when you think the consequences of the matter. 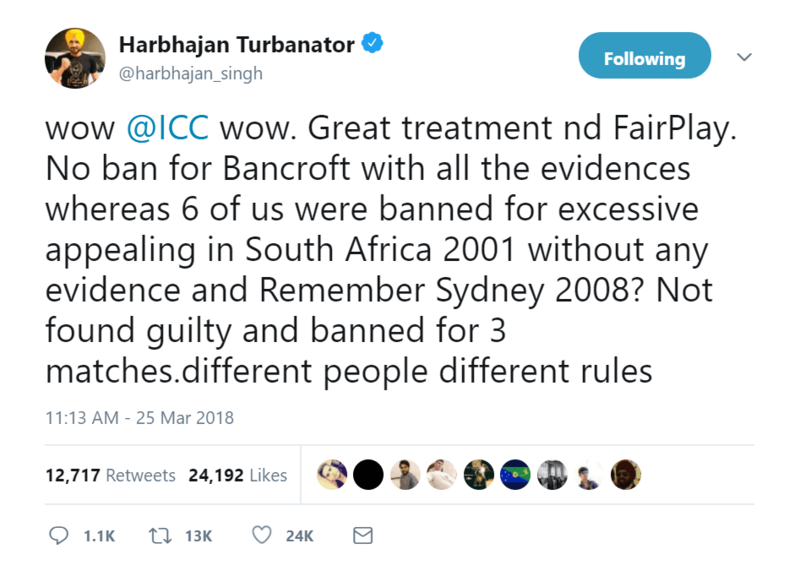 By the way Harbhajan Singh took to twitter to mention how severely they have been punished in the past for lesser acts. Harbhajan Singh has a point here. Sub-continent players and the blacks have been dealt differentially. Smith mentioned the ‘Leadership Group’ responsible for the shameful act of cheating. In that case, I expect harsher measures from Cricket Australia. In the past they haven’t shown any remorse for such acts and expect them to do the right thing again. As a cricket aficionado, I want the leadership group to be brought to light and punishments for all of them. This should possibly include, the captain, vice captain and the coach. The NOC for playing in the IPL should also be not given. Time to act tough Cricket Australia, you still have a lot to lose.